released on 7″ single Face/Eat Toast, Epic Sweep (2012). Album mastered by Forbes Williams. All songs p+c MarineVille. Cover from Public Domain. instructions; Kirsten Van Newtown, Alan Sunderland, The Terminals. You can also find the album on Bandcamp. US CUSTOMERS, please use our much cheaper, new Grapefruit ordering option. Price per LP: US$20.oo. Shipping to US destinations is US$5.50 for a single LP. For each additional LP, add US$1.00. All you need to do is let us know that you want your vinyl to be mailed by Grapefruit. Alternatively, you can also order through the Grapefruit website. “No-wave keyboards, coarse and/or slashing guitar and those non-mawkish emo vocals that NZ is famous for …” (Byron Coley, The Wire). “This fourth since ’99 by a band out of Wellington — with Denise Roughan of 3Ds on bass — doesn’t sound like a band which has settled into a pattern or routine. They are still a bit off-kilter and play with the enthusiasm of novices.” Click HERE to read Graham Reid‘s Elsewhere review. “Penguins Ate My Chips has a unique Kiwi Punk underground flavour, and in my opinion is well worth a listen to.” Click HERE to read the full review on http://www.muzic.net.nz. “MarineVille hail from Wellington and play a raw and distinctively New Zealand version of “driving rock” music.” Click HERE for the PopLib review. “Certainly, Penguins is a brash, lurching, agreeably ramshackle record that deserved far better than simply getting lost down the back of our cultural sofa.” Click HERE to read Grant Smithies‘ write-up and listen to Kathryn Ryan‘s RNZ interview with Grant Smithies. 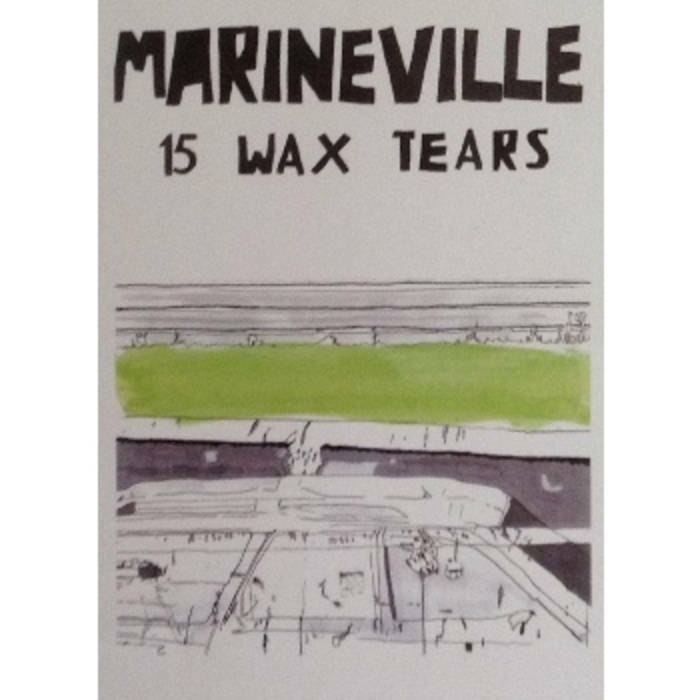 Purchase includes a download code for both the entire album and 15 Wax Tears, a collection of MarineVille (same lineup) live recordings dating from 2011. 15 Wax Tears was originally released on cassette by Epic Sweep Records on November 14, 2012, and has some Penguins songs and some MarineVille “classics” from the previous three albums. 15 Wax Tears cassette (Epic Sweep Records, 2012).